Nasturtiums are a rather old-fashioned flowering annual most gardeners nowadays ignore. However, there is a lot to be said about these charming colorful plants the least of which is that both flowers and leaves are edible. Young tender leaves add a spicy flavor similar to watercress in salads. You can also use them as garnish on plates or platters. Flowers are trumpet shaped with five petals and come in a variety of vibrant jewel-like colors including white, pink, yellow, orange, red and maroon. The smooth succulent leaves are either solid green or variegated with cream. These are round and from two to five inches in diameter. Standard plants form an attractive mound up to 2 feet high covered with blossoms. They can be used in beds or borders or tucked in between vegetables where they will attract aphids away from your crops. There are climbing and trailing varieties which do well in window boxes or hanging baskets. These can also be used on trellises or fences to provide a soft colorful summertime screen. All make excellent long lasting cut flowers. Even though nasturtiums prefer dry soil, keep an eye on them and water during dry spells to keep foliage lush. Don't fertilize at all. Fertilizer will induce lots of growth but few flowers. 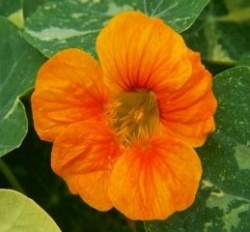 Nasturtiums will grow in sun or partial shade and are not particular about soil. In fact, they prefer poor sandy areas. They are easy to grow from seed and will come up quickly when planted directly outside beginning in early spring when danger of frost is past. Plant about 1/2 inch deep and eight to twelve inches apart. They will also grow readily from cuttings taken from mature plants later in the season. Don't forget to deadhead spent blossoms for continuous bloom. You can harvest seed for the following year if you stop deadheading near the end of the growing season. Watch for pests. Aphids, slugs and leaf miners love nasturtiums.